Diamonds, the best-known, most sought-after gemstones always known for its beauty and elegance and radiant sparkling light. These hard stones are the softest way to touch a lady’s heart. They contain the most minimal impurities, pure… just for the pure you! Diamond wedding rings have been used to symbolize weddings since at least the 15th century. 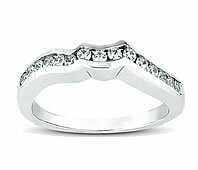 Your diamond wedding ring is a symbol of your love and commitment, and a major part of your marriage ceremony! While some couples are opting for less traditional symbols of their marriage vows, such as tattoos or other types of jewelry, most brides are still interested in using rings in the ceremony. A diamond wedding ring is something that you will be wearing every day for the rest of your life, so it’s important to take the time to choose one that will stand the test of time and will be comfortable on your finger. The diamond wedding rings, that most famous and instantly recognizable symbol of the (hopefully perpetual) joining of a man and a woman as husband and wife in the institution of marriage. Its beginnings lie in the deserts of North Africa, where the ancient Egyptian civilization sprang up along the fertile flood plains of the river Nile. This river was bringer of all fortune and life to the Pharaoh’s people and from plants growing on it’s banks were the first diamond wedding rings fashioned. They wore it like we do today, on the third finger of the left hand, because of a belief that the vein of that finger directly traveled from the heart.